This is literally a video of a corgi wandering and playing around town. There's absolutely nothing better. From its cute corgi and the little waddle, this is a video you can't help but fall in love with. Plus the song is so catchy!! Not only is this a great bop but it also features the cutest golden retriever ever. There's nothing more attractive than a man with a pupper. Peep the first look of the pupper with Gong Chang at 1:23. This tropical vibe is a perfect way to get ready for the warm weather and beach vibes. Also, this song features an incredibly cute scene with Winner's visuals, Jinu, playing with a tiny pup starting at 1:48. With an exciting and fun beat, CLC offers a cute search for a way to catch the attention of the male protagonist. But what definitely caught my attention was the cute dog at 2:00. As photographers wait to catch a glimpse of the queens, Girls' Generation, they sure were surprised instead to catch a glimpse of a fashionable poodle strut out of the room just as elegantly and beautifully as our queens would have. Heaven is anywhere with puppers. And if Eric Nam is there as well, then heaven just got a bonus point. The beautiful husky gets introduced early on in the MV starting at 0:35 and continue to make little appearances here in there. Se7en shares a delicate love song but he rewards us with a great music video featuring a walking cloud at 0:45. The gentle giant is delicate in its interactions and obediently waits for their next activity together as the owner runs errands for the lady he loves. A perfect song to wake up to as the spring weather starts to come around. And it's also perfect timing to spend time with your pup as NIEL does at 0:38. The chic girls of MAMAMOO only choose the best of the best for their videos and of course they would choose the chic french bulldog to match their aesthetic at 2:04. Big Bang have always been huge animal lovers with G-Dragon filming with tigers and bears and T.O.P with goats and snakes. 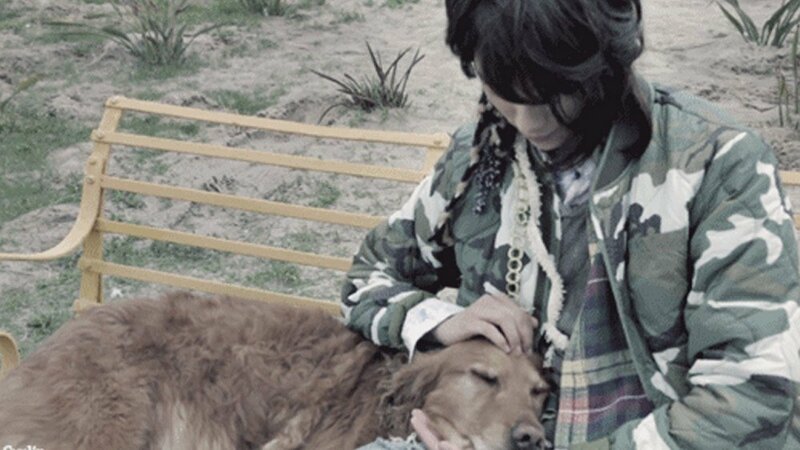 But the cutest one yet is when Taeyang interacts with a little dog similar to his own at 0:53 even giving it a little high five.